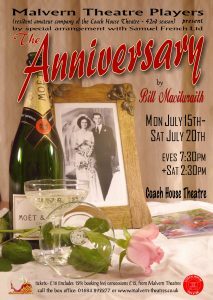 For events in the Coach House Theatre the Malvern Theatre Players members provide front of house services including interval light refreshments. Users can, if they wish, offer a glass of wine with their ticket. However, the venue is not licensed for the sale of alcohol. There are a number of bars within a few minutes walk of the theatre, including the Malvern Theatres complex, that provide excellent beverage services. Similarly, users are welcome to use outside caterers, or provide their own food and other refreshments for meetings or other social events.